Review posted November 8, 2017. Listening Library (Penguin Random House), 2017. 7.5 hours on 6 compact discs. 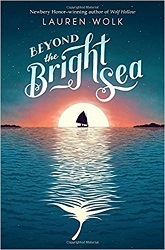 Beyond the Bright Sea tells the story of a 12-year-old girl living on a small island off the coast of Massachusetts. When I was a baby, someone tucked me into an old boat and pushed me out to sea. I washed up on a tiny island, like a seed riding the tide. It was Osh who found me and took me in. Who taught me how to put down roots, and thrive on both sun and rain, and understand what it is to bloom…. And then, one night when I was twelve, I saw a fire burning on Penikese, the island where no one ever went, and I decided on my own that it was time to find out where I’d come from and why I’d been sent away. But I didn’t understand what I was risking until I nearly lost it. This book is set in the 1920s. The island called Penikese is where about ten years earlier there’d been a leper colony, with the residents kept isolated from any other human beings. Is Crow’s story connected with theirs? Miss Maggie lives on Cuddyhunk, the next island over. She has helped Osh care for Crow since she first washed up on Osh’s island. Miss Maggie wrote letters to Penikese and several other places, asking about a missing newborn baby, but never got any reply. All the same, the islanders treat her as if she will sprout a dreadful disease at any time. At first, Crow wants to prove she’s not from Penikese. But the more she finds out, the more that changes. There’s a surprising amount of adventure in what starts out sounding like a quiet story. Crow’s quest to find her origins ends up involving shipwrecks and pirate treasure, but all with plenty of love from Osh and Miss Maggie. I wasn’t crazy about the narrator – she read the story almost too calmly and quietly, though to be fair, Crow is a calm and quiet child. There are also some coincidences in the story itself. I was somewhat disturbed by the presence of a purely evil character – I think a little more so because there had also been a purely evil character in Lauren Wolk’s previous book, Wolf Hollow, which was also very good in spite of that. I guess I was willing to overlook it the first time, but the second time that particular objection gets a little stronger. That said, this audiobook made absorbing listening, and I would love to meet Crow, Osh, Miss Maggie, and their cat named Mouse. Lauren Wolk’s good people feel like real people you’d love to meet, and she makes the world of these 1920s islands come alive.